Joy (Jennifer Lawrence) had such high hopes growing up. Her dad, Rudy (Robert De Niro) encouraged her creativity. She knew she would grow up to create things that would help people. Unfortunately, life had other plans. After her parents’ divorce, Joy’s mother, Peggy (Elisabeth Röhm) confined herself to her bed, spending all day watching television. Joy was responsible for everything, as her mother couldn’t trouble herself to get out of bed for anything. Luckily, Joy and her ex-husband, Tony (Édgar Ramírez) were friendly. So friendly, in fact, that Tony lived in the basement where Joy and her mother lived. This meant he was around to help raise their daughter. After spending so much time cleaning, Joy comes up with an idea for an invention. She makes a prototype of a self-wringing mop. The only problem is, she is having trouble selling it. When she finally gets the chance to show it to someone who could sell it, she meets Neil (Bradley Cooper), an executive at the Home Shopping Network. Despite a less than stellar sales pitch, Neil sees the potential and gives Joy a spot on the channel to sell her new mop. When the first go around, by one of the channel’s best salesman, doesn’t go well, Joy decides to do it herself. She now has the opportunity to take her future into her own hands, but that just opens up a whole new world of responsibilities that she must now deal with. Director David O. Russell brings back his A-list team from Silver Linings Playbook and American Hustle, Jennifer Lawrence, Bradley Cooper, and Robert De Niro to tell the true story of how one woman, Joy Mangano, came from nothing to become a very powerful business woman. Given how good Silver Linings was, this should be a sure-fire hit. The chemistry we saw from this trio in Silver Linings is still there. These guys just work great together. Jennifer Lawrence plays up the title character’s desperation convincingly. De Niro is just funny enough as her dad, who is forced to move back in with her. And Cooper is the charming, savvy business man. His character is a shrewd business man who knows how to play the game, but he does so without ever becoming unlikable. Sadly, Lawrence, Cooper, and De Niro are the only good things about this movie. Being based on a true story, the script is mostly written for them. Unfortunately, it gets to be a rather depressing story at times. Joy is continually beat down, as hardship after hardship fall into her lap. This could make for an uplifting story about perseverance and overcoming. However, due to the pacing and execution, it becomes a slow, oppressive film. It isn’t the light-hearted, feel good film we are promised by the trailers or the title. Weighing it at just over 2 hours, you feel every minute of it. And then some. 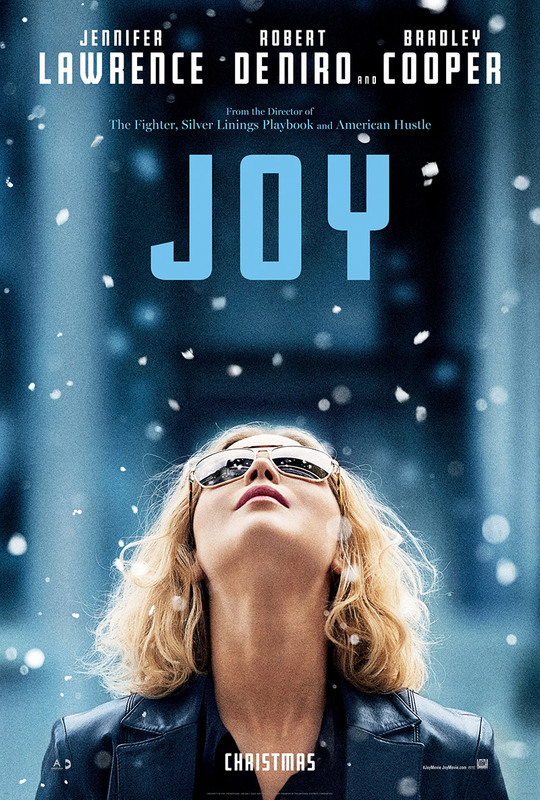 Despite a talented cast and director that were such a winning combination in the past, I have to recommend skipping Joy. It lacks anything keeping you interested in the story and is almost painful to sit through.